Lock in a great price for Hotel Xanthippion – rated 8.5 by recent guests! Location was great, staff very friendly. Place was clean, beds OK, not great. 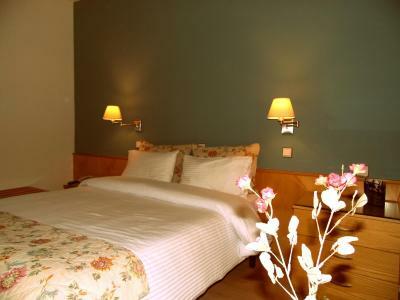 Love the location of this hotel, just a short walk from Xanthi town center and old town! We had a fabulous stay! The staff were friendly and attentive. The location was excellent for exploring the town. The breakfast was ample. Both the people and the hotel were very nice. The location was close to everything. 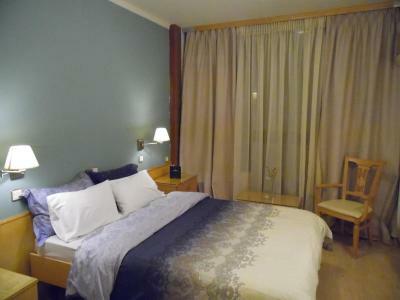 A very good situated hotel, close to the Old Town, it is about 5 minutes walk. The hotel has a parking which is very important. The room was small, without a balcony, but very clean and well furnished, not new, but nice. The staff was very polite and helpful. This is an inexpensive hotel, but the staff are exceptionally helpful and cheerful. Great value for the money. 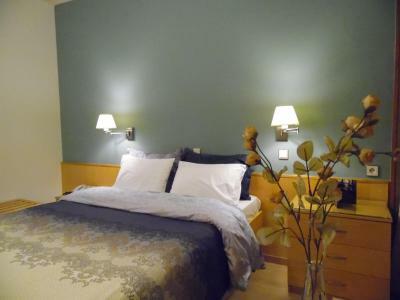 Comfortable room, good breakfast, friendly staff, etc. To our regret,. we were there for very short time and cannot write more. Hotel Xanthippion This rating is a reflection of how the property compares to the industry standard when it comes to price, facilities and services available. It's based on a self-evaluation by the property. Use this rating to help choose your stay! 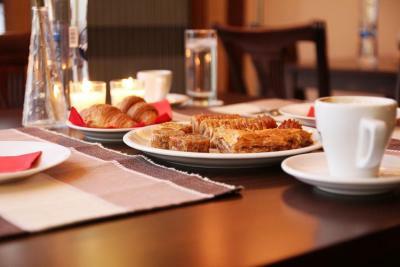 Centrally located in the scenic town of Xanthi, Hotel Xanthippion is just 1,650 feet from the Old Town and offers a snack bar. 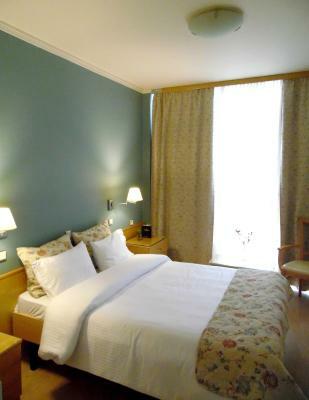 It features air-conditioned rooms and free Wi-Fi. Free, secure private parking is possible on site. A TV with satellite channels, fridge and safety deposit box are included in all rooms at the Hotel Xanthippion. Each has individually controlled heating and a private bathroom with toiletries. Breakfast is served in the dining area while light meals, desserts and drinks are provided at the snack bar until late in the evening. Room service is also possible. The central square is within 1,000 feet and features restaurants, bars and shops. Xanthi Train Station is 1,650 feet away. Staff at the 24-hour front desk can arrange car rental. The town of Komotini is 31 mi away. When would you like to stay at Hotel Xanthippion? 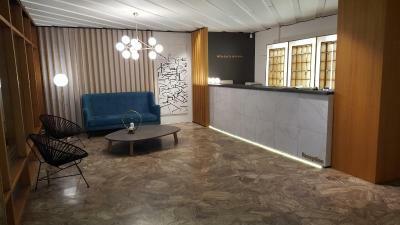 Centrally located this air-conditioned room offers free Wi-Fi. A TV with satellite channels, fridge and safety deposit box are included. House Rules Hotel Xanthippion takes special requests – add in the next step! Hotel Xanthippion accepts these cards and reserves the right to temporarily hold an amount prior to arrival. The breakfast could have been a little fancier. The room doors need some sound proofing as you could hear everything happening in the corridor and also you can hear the elevator noise. Experience was OK. Hotel is just a bit old, facilities old and funky, breakfast not fresh. The water glasses were 200 ml, we needed 250 ml ones for our morning water-honey-lemon glass. The lobby and room smelled of cigarettes. Extremely unpleasant when you are with a child. Relatively clean rooms, but I expected more for a three-star hotel. The hotel was full. There was a group of travellers, who were too noisy. The insulation of the rooms is rather poor, and I was waken up by the group at 06:00 a.m.
Breakfast was no fresh, eggs smells bad and salad was old. I hope to make better breakfast and see you soon again. Very nice Hotel with private parking ! Staff was very polite!